“A winning look at the stories behind 45 pop, punk, folk, soul and country classics” in the words of Mick Jagger, Stevie Wonder, Cyndi Lauper and more (The Washington Post). Every great song has a fascinating backstory. And here, writer and music historian Marc Myers brings to life five decades of music through oral histories of forty-five era-defining hits woven from interviews with the artists who created them, including such legendary tunes as the Isley Brothers’ Shout, Led Zeppelin’s Whole Lotta Love, Janis Joplin’s Mercedes Benz, and R.E.M’s Losing My Religion. After receiving his discharge from the army in 1968, John Fogerty did a handstand—and reworked Beethoven’s Fifth Symphony to come up with Proud Mary. Joni Mitchell remembers living in a cave on Crete with the mean old daddy who inspired her 1971 hit Carey. Elvis Costello talks about writing (The Angels Wanna Wear My) Red Shoes in ten minutes on the train to Liverpool. And Mick Jagger, Jimmy Page, Rod Stewart, the Clash, Jimmy Cliff, Roger Waters, Stevie Wonder, Keith Richards, Cyndi Lauper, and many other leading artists reveal the emotions, inspirations, and techniques behind their influential works. 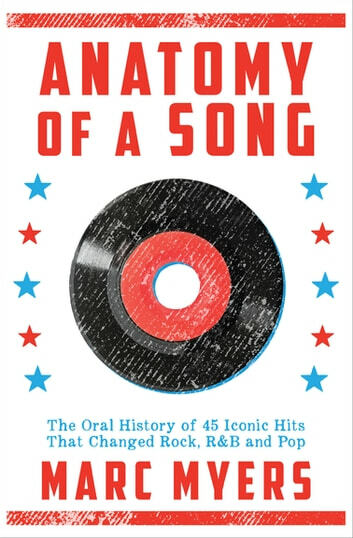 Anatomy of a Song is a love letter to the songs that have defined generations of listeners and “a rich history of both the music industry and the baby boomer era” (Los Angeles Times Book Review).